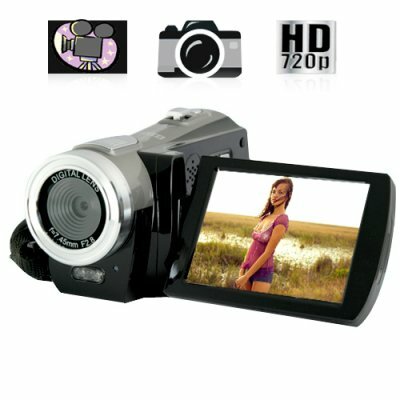 Successfully Added High Definition Camcorder with 3 Inch Flip LCD - 720P to your Shopping Cart. High Definition Camcorder with 3 Inch Flip LCD (720P). Record all your experiences in high definition up to 60FPS! Take this camcorder with you to capture high definition video everywhere you go. No matter whether you're buying your first camera or replacing that clunker in your closet, now is the perfect time to catch the high-definition wave. If you are used to taking videos with blurry faces and fuzzy images, then prepare to be blown away when you experience high definition video with crystal clear images and rich colors. This camcorder is so simple to use, pros and first timers alike can both enjoy it. Having a big flip out viewscreen, it is easy to setup and capture all the nearby action. Records video in multiple resolutions including youtube friendly 720P in high frame rates (up to 60FPS). You can take advantage of the stabilizer to keep your images steady when you're filming videos or pictures if you want some extra "help" from the internal intelligence system. This model supports SD memory cards up to 16GB, letting you capture hours of footage in high definition quality. You can also use this camcorder's still image camera feature to capture high-res photos of up to 12 megapixels. When you're finished, connect the camcorder directly to a high definition monitor with the included HDMI cable or to a TV with the AV cable to re-live all the fun with your family and friends. The camera's light weight and sturdy carrying case let you take it with you anywhere so you can capture videos and pictures on a moment's notice with no setup. The 3 inch TFT display screen lets you capture your target easily, view playback clearly, and even film yourself. Intuitive controls and a simple menu system make this camcorder easy to use and customize for both beginners and experts alike. Ease of use and high definition video quality make this camcorder perfect for capturing every moment of weddings, vacations, reunions, office parties, birthdays, and all of life's unforgettable moments. Don't just capture memories on film, relive them in high definition! Take advantage of Chinavasion's unbeatable factory-direct prices to get your hands on this high definition camcorder today. In stock in our warehouse right now, it is available for single piece or bulk orders. Don't delay any longer, order it now to get yourself that HD camcorder you deserve! Can I use this camcorder to film myself? Yes! The viewer rotates 270 degrees, so you can easily hold the camcorder with one hand and film yourself accurately. The image inside the viewer rotates automatically for easy viewing. What does FPS stand for, and why is it important? Product arrived super fast shipping, good product and everything works as described. excellent high degree of professional sellers buy from you again. thanks to the team of Chinavasion.